Why did the Berlin Wall come down? On November 9,1989 the unthinkable happened in Germany. The Berlin Wall, which split the present German capital in two and became the symbol of the division of the German people during the Cold War, fell after 28 years of construction. Only days before this event, Berliners, both western and eastern, maintained the feeling that this 155-kilometre-long wall was insurmountable and indestructible. However, it did happen. 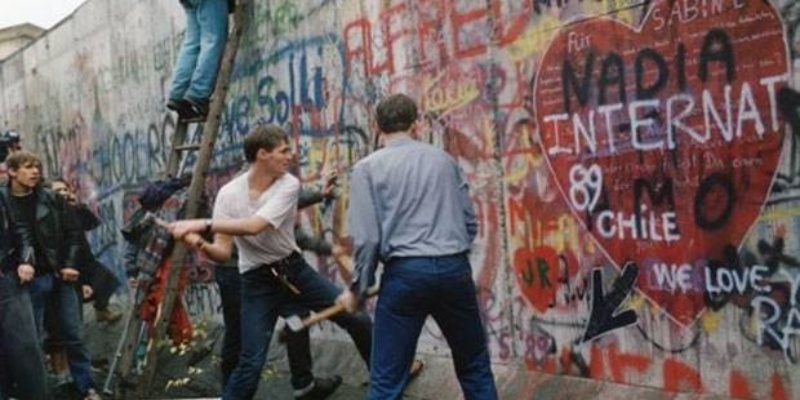 The wall collapsed after a series of political and social events and triggered the euphoria of Germans and citizens from other parts of the world who learned about the event through news cables or satellite images. The morning after the first night that marked the beginning of the fall of the wall and with it other events that took place at the end of the Cold War, the then mayor of West Berlin, Walter Momper, said in a speech: “Last night the German people were the happiest people in the world”. At the end of the Second World War, Berlin was divided into four occupying sectors: Soviet, French, English and American. Subsequently, in 1949 the East Soviet-held area came under the jurisdiction of the so-called German Democratic Republic (DDR) and the other three formed a single area governed by the Federal Republic of Germany (FRG). In the following years, the western zone began to prosper while the Soviet side was experiencing economic problems. This caused millions of Berliners living under the communist regime to migrate to West Berlin. It is for this reason that on the night of 12 August 1961 the GDR authorities decided to erect a provisional wall and close 69 of the 81 checkpoints along the line dividing the city in two. A day later, a 155-kilometre temporary fence had already been laid, interrupting overnight the transit of vehicles and people, many of whom were working in the other part of the city. In fact, the first person to die trying to cross the wall, Günter Litfin, was shot when he tried to return to West Berlin, where he lived and worked. The fall of the wall originated in the opening of the borders between Austria and Hungary in May 1989. The former belonged to the Western bloc while Hungary was part of the bloc known as the Iron Curtain, countries whose regimes were under Soviet influence. As a result of this opening, more and more East Germans were travelling to Hungary to seek asylum in the various embassies of the Federal Republic of Germany. This annoyed the government of eastern Germany and began to impose restrictions. It was then that thousands of East Germans began to demonstrate in several GDR cities demanding free movement on the border. The protests forced the government to announce that the crossing to the west was allowed. It was November 9,1989. However, the triggering event was the confusion of a government spokesman at a press conference in which, in an effort to calm the spirits of the population, he announced the new rule that allowed them to leave the country without any prerequisites. Günter Schabowski, a member of the Politburo in the GDR, explained the details of the government’s decision, when journalist Riccardo Ehrman of the ANSA news agency asked him when the measure came into force. Schabowski, perhaps a little nervous, searched through his papers and, finding nothing written, answered:”immediately.